Norwegian oil services firm Aker Solutions signed one of Scotland’s largest office leasing deals, as part of expansion plans in the UK. The New build covered 1,000,000 sq ft of offices of which Aker rented 335,000 sq ft of office space at Aberdeen International Business Park from the developer. The new build consists of three interlinked buildings within a prime location opposite the entrance to Aberdeen International Airport. The three interconnecting buildings includes catering facilities, fitness centre with squash courts, nursery, medical facilities and an auditorium. The new facility has the capacity to house about 2,400 employees from different business streams in an area that is expected to benefit from development in surrounding infrastructure. This includes the Aberdeen Western Peripheral Road which is set to be completed in 2018. 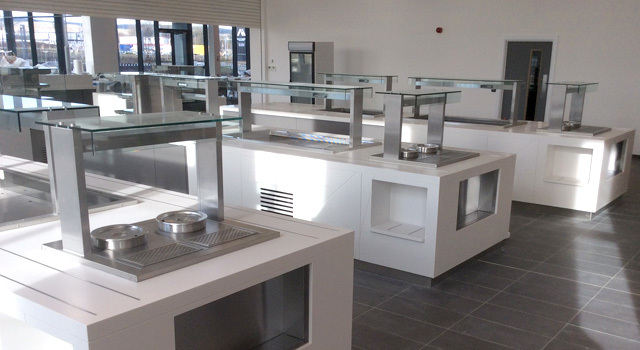 ScoMac Catering Equipment Ltd remit was to analyse the catering facility at Aker’s Norwegian headquarters in Stavanger and adapt it to the UK market. 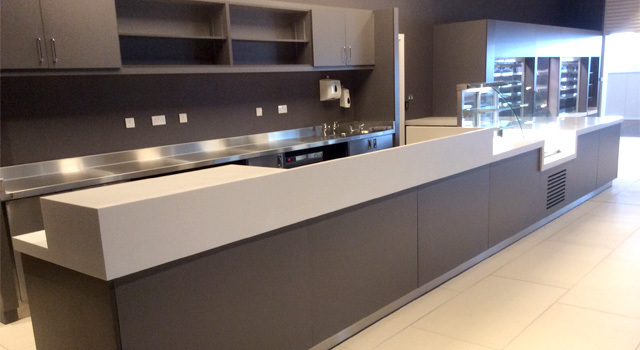 The specification was to utilise heavy duty durable and versatile cooking appliances with high end quality front of house Corian finishes where possible via ScoMac’s own in-house specialist shop fit team. 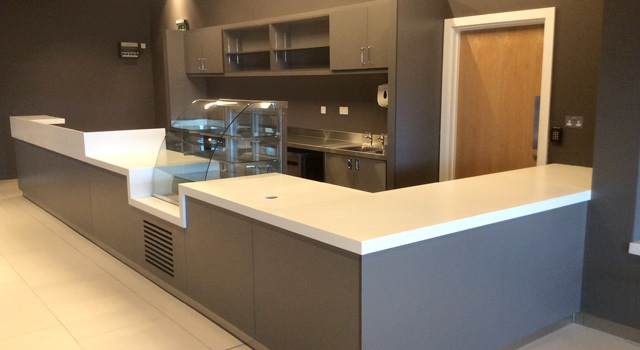 The back of house production and main meal / food offering was to cover a variety of hot and cold options for around 1,500 plus staff over three sittings with additional satellite Coffee Shop, Fresh to Order Sandwich Deli, Juice Bar, Nursery and Internet Shopping storage facility. 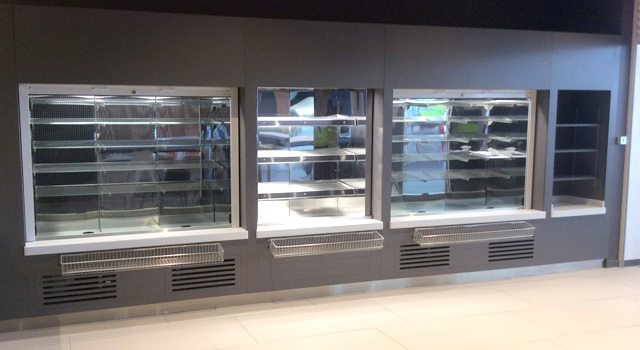 Another catering requirement was for a live theatre cooking facility within the main servery area which was to be mobile and self venting. So on the rare hot summer days in sunny Aberdeen the cooking could be transferred outside for special events enjoying alfresco dining or along to meeting rooms for a more personal dining experience. Early feedback from the client and the incoming contract caterer are all very positive with an exciting view to going live in the second quarter of 2015.